I love to cook & bake. I am going to try to blog one recipe a week, we have so many favorites that I want to make sure I get them shared! We have had a ridiculously hot summer here in the Midwest. One of our favorite ways to cool off is with a little bit of ice cream! I have borrowed my mom's Cuisinart automatic ice cream maker, and in playing with it I accidentally created a simple but amazingly creamy ice cream! The one thing that we have not been crazy about with most quick & easy ice cream recipes is that they are not creamy, and do not freeze well. I was going through my pantry one day and saw a can of fat free sweetened condensed milk and I thought, hmmm I bet I could make ice cream using this - I was right! This has to be the easiest thing I've ever made! Make sure the half & half and Condensed Milk are good and cold. Mix all 3 ingredients together before pouring into ice cream machine. Gently pour into machine, wait 25-30 min and ta-da you have perfectly delicious ice cream! This can also be put into a container and stored in the freezer to have later! 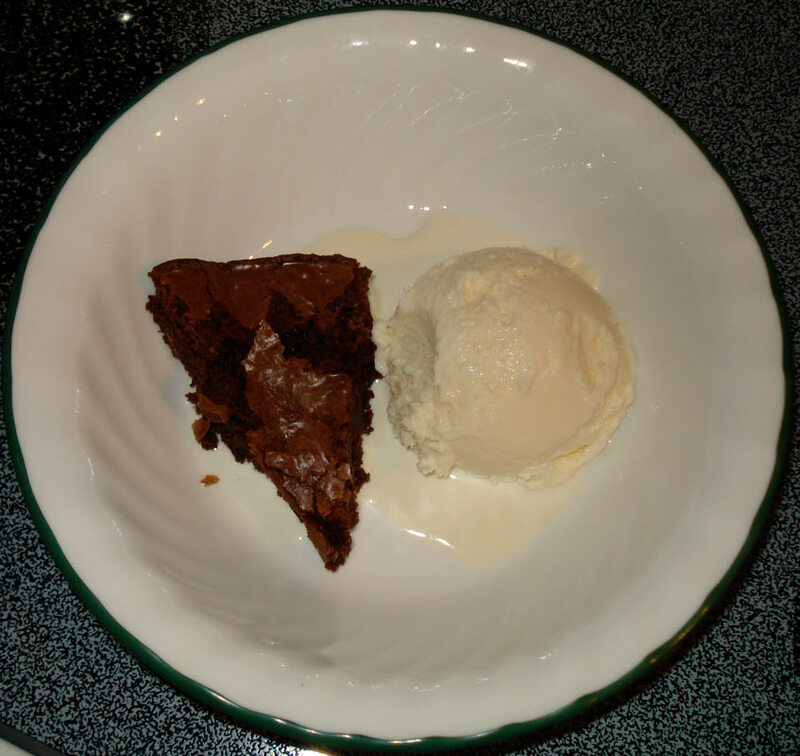 It can also be served alongside a delectable brownie! Want that recipe also? Ok, go to your grocery store, pick up a Ghiradelli Double Chocolate Brownie mix, bake as directed. I have yet to bake brownies from scratch that even come close to how fantastic these are. I hope you enjoy this recipe and please let me know if you make it! Next week I plan on sharing our favorite pizza dough recipe and my husband's awesome pizza sauce recipe, we use both every week on Pizza & Movie night at our house! I have a ton of coupons to clip and I am going to switch out my coupon binder and re-organize a bit! What can I say I am just a party waiting to happen!! Have a Fabulous Monday! We LOVE cucumbers. Love to eat them, love to grow them, sometimes we even love to share them. It is possible we went a little crazy planting cukes this year. Then with all this heat there was the concern that it would kill them. Here is a picture I took last night of the garden, obviously they have survived the heat! There are about a dozen mounds of cucumbers here with an average of 3 plants per mound. We are finally having to pick on a daily basis, which means soon I will be able to start pickling! Until then we are eating the ones daily that we are picking. 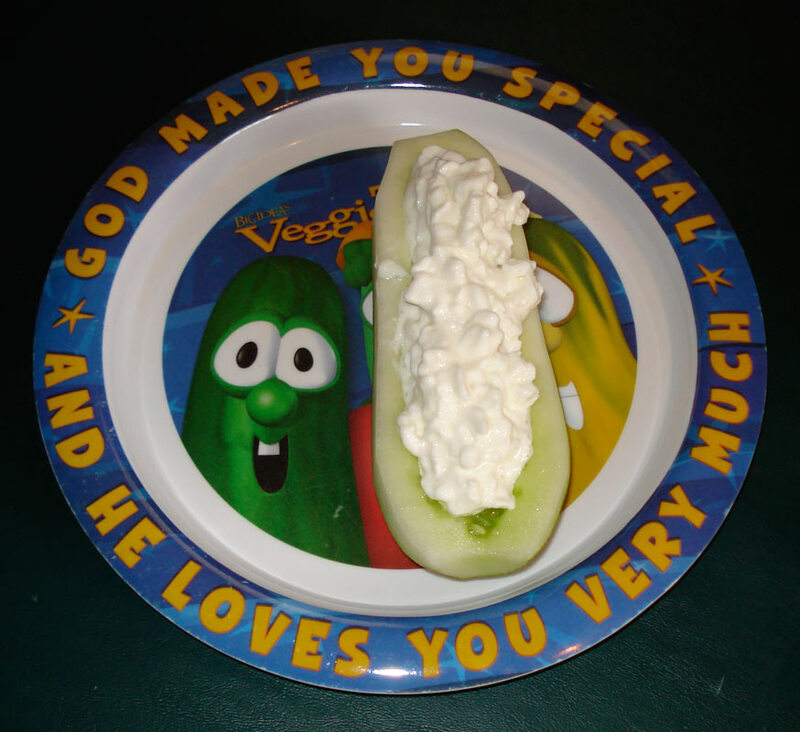 One of my kids' favorites is a "Cucumber Boat" they will literally eat this every day. It is something I came up with last year when we were drowning in cukes. Take a little of the peel off (makes it a little easier for kids to eat), scoop out the seeds inside - I usually eat these or share them with another family member who loves them, and scoop in some cottage cheese, I also usually sprinkle Nature's Seasons on it. Ta - da, Cucumber Boats! 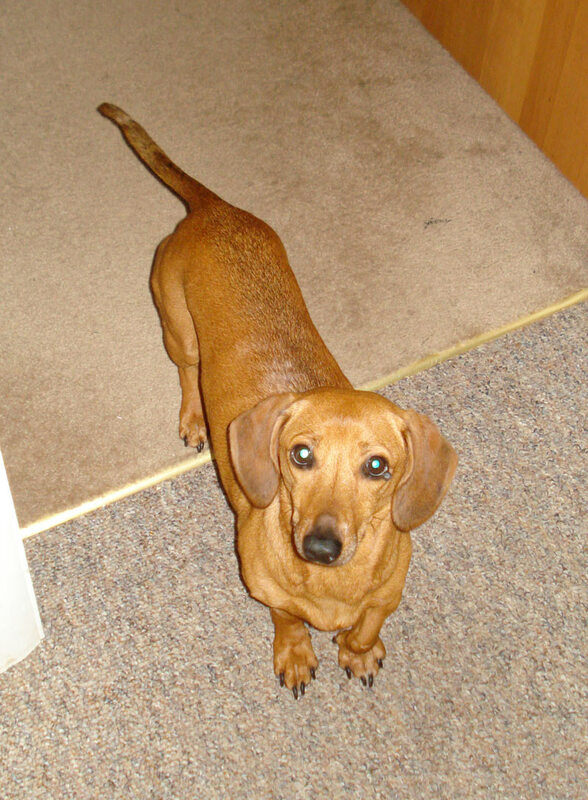 It is almost as if she is saying "I can haz cucumber? ", being the softie I am I do tend to share with her. She will sit at the line between the kitchen & dining room and watch me the entire time I am working with vegetables. 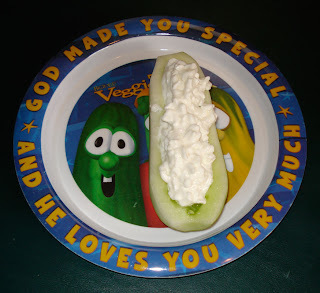 My boys love cucumber boats (who am I kidding, so do I! ), the dog loves cucumber scraps but the thing I love most is cucumbers & buttermilk. It is something I have had for years, I particularly remember sitting at Grandma's table and having it with cukes from Grandpa's garden. The tanginess of the buttermilk and the crunch of the cucumber is just a combo I can't seem to get enough of in the summer! The fact that it is super easy to fix is just a bonus! 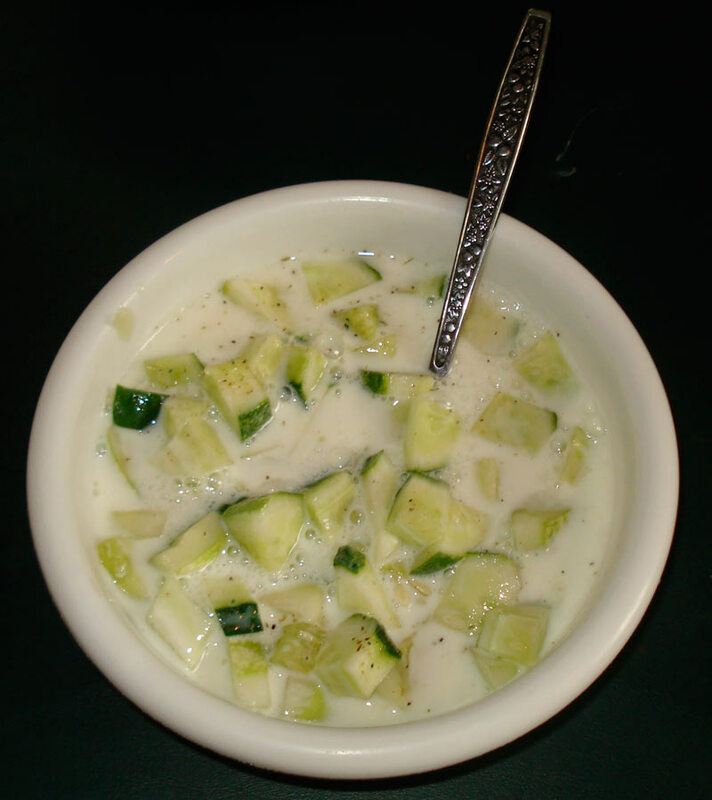 Chop up some cucumber, put it in a bowl, sprinkle with Nature's Seasons and pour buttermilk over it! Yum! I'll bet you didn't know that cucumbers are this awesome! Well, they are! I can't wait to start canning some, I made a bunch of dill pickles last year and they were a huge hit. In other news, school starts in a week! I am quite excited as this will be the first year that both boys will be in school all day, 5 days a week. I have so many things I hope to get done during those hours alone. However, I imagine the first week will just be me enjoying some peace & quiet!! If you didn't read the title like Dorie singing "Just keep swimming" you need to go back and do that now. Ok, now that I have that stuck in your head (you're welcome!) you are probably wondering what on Earth I mean by pinning. Unless you have already discovered Pinterest, then you know EXACTLY what I am talking about! The first time I checked it out I really thought it was just meh. However, then I started really delving into it and checking out other people's "pinboards" and I got sucked in! I love that I can sort things however I choose! Before I started using Pinterest I would just bookmark sites either on the desktop or on the laptop. Problems would arise when I forget what I bookmarked where! Using Pinterest fixes that for me as I can access it from any computer, and it keeps things organized! I still don't have all the categories like I want them but I keep tweaking it a little more and eventually it will be exactly what I want! Currently most of the things I have on there are things I can make either baking or crafting! If you haven't checked it out, you definitely should - but I will warn you that it can be VERY addictive! Here is the link again: Pinterest.